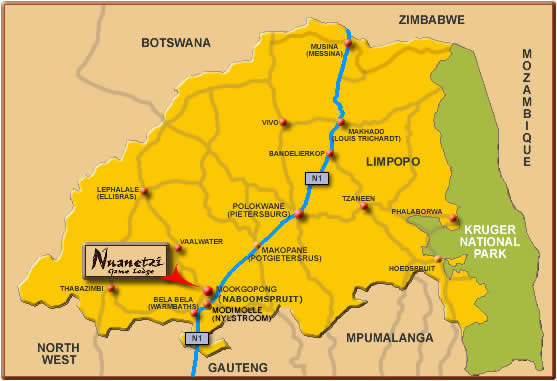 Click here for a map..
A stone’s throw away from Nuanetzi Private Game Lodge is the Nylsvlei Nature Reserve (3,100 ha), 20Km south of Mookgophong, a flood plain in the Nyls River, renowned for its abundant bird life. There are hot springs of about 39°C in the nearby Waterberg. Mookgophong was founded in 1910 when tin was discovered here. It was originally named Naboomspruit after the Euphorbia tree which grows in the area. The mining shanty town grew into a village by 1919. The name Mookgophong was given to Naboomspruit in 2002. Farming: Maize, ground-nuts, citrus, tobacco, cattle and game farming. Moderate to hot in summer with clear skies, summer rainfall. The area has a pleasant, mild climate during the winter months with an average of 286 sunny days every year which adds to the popularity of this destination. Our temperature in summer range between 15,7°C – 30°C and winter from 6,7°C – 24°C. Winter is the best season for game viewing as the grass is shorter and the growth less dense. Also visit: www.weathersa.co.za for daily weather forecasts. Bela Bela (Warmbaths) (Also visit: www.belabelatourism.co.za for more information). Bela-Bela, a Northern Sotho name meaning “Boiling-Boiling”, which is synonymous with the town’s world-renowned hot water springs was discovered by the Tswanas in the 1800’s. Hot water bubbling out of the earth at approximately 22 000 liter per hour with a temperature of 53°C and in close proximity to Gauteng make this destination even more popular.